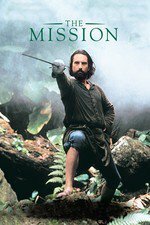 "'The Mission' was produced by David Puttnam and directed by Roland Joffe, the same team that made the great film 'The Killing Fields.' That film was fired by a pure, burning anger against a great injustice, and it had a dramatic center in the life and saga of Dith Pran, the Cambodian who survived the occupation of his land and eventually lived to find freedom. Pran's story was a magnet that pulled us through the film. 'The Mission' has no similar pull. Indeed, it hardly seems to have a center and feels like a massive, expensive film production that, once set in motion, kept going under its own momentum even though nobody involved had a clear idea of its final direction. "I suggested that no single shot in the movie is without interest. "That is probably true. The locations are spectacular - especially a waterfall that supplies the great opening image of a crucified missionary floating to his doom. The actors are effective in their individual scenes. The mysterious atmosphere of the forest seeps into the story and lends it a certain mysticism. All that was needed to pull these elements together was a structure that would clearly define who the characters were, what they stood for and why we should care about them. Unfortunately, that is all that is missing." There's some really interesting triva on this film at Imdb. I remember the middle of the film as almost unwatchable (and I was even more tolerant of Faith oriented navel gazing back then), but the ending as amazing. The music in the movie was very affecting, and the first time I sought out a soundtrack. IIRC I was disappointed because there was no song that recreated the heartstopping drama of the climax (a la Carmina Burana and Excalibur, gimme a break I was young), but it was broken into shorter pieces. In retrospect I'm not sure if the ending was even that dramatic, or if was just a relief that finally things were happening. When I saw the film in college, I was too busy being challenged by the ideas (and the post-credits shot) to think critically about the film itself as a film. It was a fascinating, challenging piece of work that made an impact upon me. I haven't seen it in many years, and am not sure how it would hold up to a critical viewing as an adult. I'm sure the imagery will still be arresting, less sure about plot and pacing. Either way, the score is amazing. One of my favorites of Morricone's 80s scores.